Home»Lifestyle»Can this fitness trend inspire the people who hate exercise? I understand why people hate exercise. Take away ability (because there are people with and without natural competence who enjoy exercise) and the fact that some people are less genetically inclined to get a dopamine high from HIIT, and you are left with the fact that exercise isn’t fun anymore. At least it’s not for a lot of people. We go from movement being a form of messing around and play as children to movement being a brainless, boring form of torment in a smelly, windowless box as adults. Experts, wringing their hands at the dire cost of our collective lack of movement, have explored everything from the minimum amount necessary (30 minutes of moderate exercise a day or one minute if you go full-blast) to paying people to go to the gym (it doesn’t work for long). Then there is the radical idea to inject the fun back in. One new study, published in JAMA Internal Medicine, found that if you essentially turn exercise into Pokemon, then people moved “significantly” more than those who just monitored their daily movement with a fitness tracker. The blurred lines of entertainment and exercise, fitness and fun may help to explain the appeal of Ninja Warrior, which broke ratings records, but also inspired trend of Ninja Warrior-inspired gyms around the country, from Western Australia’s Ninja Academy to Terrain Training on the Gold Coast and X-Park at Bounce Inc at various locations . “I think as we grow up we take ourselves seriously, we forget how to play and how to have fun. 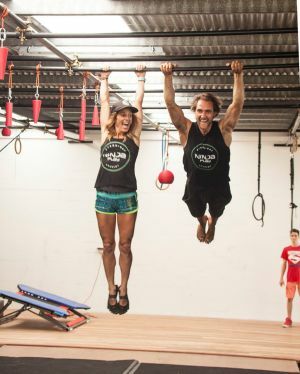 There’s something really powerful in being childlike again and I think people are able to recognise that,” says Lisa Parkes, who competed on the first season of Ninja Warrior and is co-owner of Byron Bay’s new Ninja Play Academy, a space designed for play with trampolines and monkey bars, spring floors, warped wall and ropes.